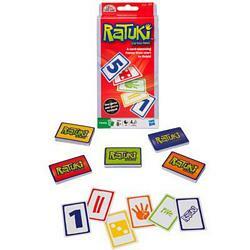 RATUKI is easy to play, fun to win and totally addictive! Build piles of cards from 1 to 5, but watch out: it’s a card-slamming frenzy! Be the first to slam a 5 on the top of the deck, shout “RATUKI!” and the cards are yours. Get slamming and get winning!